Wellness of body AND mind is an important part of life in the Rockaways, and this is reflected in the variety of health and fitness options on the peninsula. Whether you’re looking for fun in the sun, or to mellow out and find some balance, there is a wealth of opportunities to break a sweat, even on a rainy day. 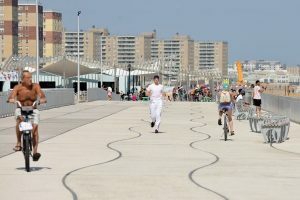 On a beautiful, sunny day, Rockaways residents love to run, walk, and bike along the boardwalk, which extends from Beach 110th all the way to the Eastern end of the peninsula at Beach 9th street. Having the ocean right out the front door also offers lots of chances to participate in fun, outdoor activities like surfing and paddle boarding. Ever wonder what it would feel like to stand on water? At A-Team Paddleboarding (http://www.ateampaddleboarding.com/), run by Amy and Andrew Dima, you can learn to stand- up paddleboard, and for an extra challenge, practice yoga or pilates atop a paddle board as you float on the ocean. Love to surf? Visit Station RBNY (https://www.stationrbny.com/) for all of your surfing needs. When they aren’t soaking up the sun, Rockaway residents also love to center themselves at yoga. Local favorite studios include Rockaway Love (https://www.rockawaylove.com/ ), Ocean Bliss Yoga (http://www.oceanblissyoga.net/ ), and Hot Yoga Rockaway Beach (http://www.hotyogarockawaybeach.com/). After a long day of sweating under the sun, it’s important to indulge a bit. Great places where Rockaway residents go to pamper themselves are Spa Rockaway (https://www.sparockaway.com/), and Nurture U Wellness (http://nurtureuwellness.com/). No matter what your choice of wellness activity, be sure to stay hydrated and, if you’re out in the sun, don’t forget the SPF! Previous StoryGreetings from the Rockaway Business Alliance! Sunshine, Surf, Shopping & Neighborhood Services in the Rockaways!